Renowned internationally for sporting success, Ireland’s opportunity to compete in global offshore sailing competitions received a boost today at the launch of Ireland Ocean Racing. The aim of this new strategic initiative is to increase the profile of competitive Irish ocean sailing andracing, inspire a new generation of competitors and to deliver future champions in this incredible sport. Today’s launch also announces the first project of Ireland Ocean Racing which unveils a new yacht racing team with the highest aspirations. Skippered by leading Irish sailor, Nin O’Leary, the aim is to compete at the highest level in 020 Vendée Globe event – the world’s only solo, non-stop and unassisted around the world sailing race. Nin O’Leary aims to be the first Irish sailor to complete this incredible sporting challenge. “This is an exciting day for Irish offshore sailing. There is such a strong maritime heritage in Ireland and a long list of incredible sailors from Joe English, Damian Foxall, Justin Slattery, Gordon Maguire to Enda O’Coineen. We have many great achievements on the water already under our belts. Now is the time to pull together and create a focused plan to pave the way for some significant initiatives and achievements over the coming 10 years and beyond”. Having managed the UK’s ocean sailing success story, the HUGO BOSS/Alex Thomson Racing campaign for over a decade, the management ofIreland Ocean Racing has significant experience and expertise in what it takes to create a winning strategy for Ireland in offshore racing. “Sailors are incredible sportspeople, having to tackle all sorts of weather conditions on seas and oceans around the world. Whether competing individually or as part of team, the skills and acumen required for offshore yacht racing make it one of the most challenging sports today. Bringing the exciting sport to more people in Ireland is really important to Ireland Ocean Racing – from participants, competitors, sponsors, spectators and supporters. It is our aim to deliver success for Ireland internationally in this sport, and we believe that we have the talent inIreland, as well as the sporting infrastructure and capabilities to be world class in this field.” added Hosford. 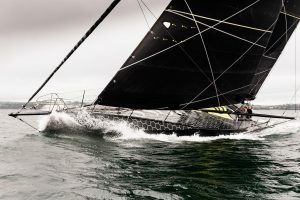 The nation’s first offshore racing entity, Ireland Ocean Racing, announced that it aims to compete in the 2020 Vendée Globe event. Only 100 people have sailed single handed non-stop around the world and no Irish sailors have yet completed the Vendée Globe event. Leading Irish sailor, Nicholas (Nin) O’Leary will skipper the Irish entry and he aims to be the first Irish sailor to complete this exciting and incredibly arduous sporting challenge. Nin has competed across a range of sailing and racing events from an early age and has raced with his father, Anthony O’Leary, and brothers, Olympic sailor Peter O’Leary and Irish Champion sailor Robert O’Leary, to many victories. His achievements include winning the prestigious AllIreland ‘Champion of Champions’ an unprecedented 3 times, as well as being part of the Yes! Racing team. “This is an important day for Irish offshore sailing and for me personally to lead the first Ireland Ocean Racing project . The campaign over the next 4 years building up to the Vendée Globe offers sponsors and investors a perfect partnership platform including branding, hospitality and dramatic content. I have just completed the Rolex Fastnet race with co-skipper Alex Thomson and now the real work starts in order to achieve the biggest challenge of all – the 2020 Vendée Globe. The Vendée Globe is arguably the single toughest sporting challenge on the planet. A 25,000 mile, single handed, unassisted and non-stop race around the world which starts and finishes in Les Sables D’Olonne in France. The sailors have to compete 24/7 for a period of around 3 months. This is a serious test of physical endurance and mental toughness. During the last event in 2016, over 2 million visitors attended the race village and the event achieved gross media valuation of €188 million AVE. Over 5000 people have climbed Mount Everest, over 500 people have travelled into outer space, however less than 100 people have sailed single handed non-stop around the world – and no Irish sailors have yet completed the Vendée Globe event.